Prior to 9/11 a person could fly with a pocket knife. In most airport arenas this constituted a blade of 4 inches or less, and it was generally recognized that airport security went with their respective State's blade length law. At that time I, like hundreds of thousands, if not millions of travelers carried a knife when they flew. 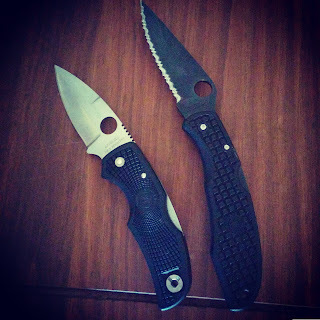 In the early to mid 90s I carried a then standard Spyderco Endura as an everyday carry. That is until the day I went to depart from Atlanta airport. A private uniformed security guard informed me that I would not be able to fly with the knife and that he would have to confiscate it. When I inquired as to why, as the blade length was not prohibited he stated that it was deemed to have an "aggressive edge" (read: it was serrated). A knife is a knife there is no such thing as an "aggressive edge" no matter what century you live in but, the confiscation was going to happen regardless. He apologized for the rules but suddenly seemed irritated when I opened the blade, stuck it under the heel of my boot and snapped the blade off. Upon returning home I decided to circumnavigate the "rules and regulations" of flying with a knife and purchased a Spyderco Native with a plain edge (along with another Endura). From 1996 to 2001 the Native became my "flying" knife. Then of course we all know what happened in September of 2001 and the course of domestic airline security made sweeping changes, but only in the bureaucratic sense. Going on fourteen years later and countless number of flights we are not safer. Our pre-flight security is not handled by professional armed counter-terrorist profilers greeting you on the walk through to your plane. Instead we have gross inefficiency that rivals what we had before 9/11 only under the federal banner. To be frank. I should be allowed to fly with my knife. So should my 60-something Vietnam veteran Father-in-law who recently had his dull as butter, tip broken, small Trapper taken from him because he left it in his pants pocket. And so should anyone else. But if we wanted to have a set of rules for flying with a knife then we would have to look no farther than the wallet. Because if a person can produce a conceal carry permit or a Federal Firearms License then why shouldn't they be allowed to carry a knife. Because gun owners, unlike every other American, has been routinely subjected to background checks and fingerprinting that goes through state and federal records that deem them "okay." I shouldn't need to go through a TSA background check so I can get permission to keep my boots and belt on. I've already done my background work. As a matter of fact I've done it several times in a couple of states. In essence my ccw says "trustworthy". Instead we are regulated to being continually treated like cattle, children, and criminal suspects all lumped into one line for the stupidity of political correctness. Instead of well paid, and well healed effectiveness. Because while you can not, under any circumstance, legally fly with a pocket knife you can however hand them your credit card and proceed to get drunk, potentially belligerent, or mood alternated to the point you go for the emergency exit door handle at thirty-five thousand feet. But granddad's Case trapper knife is a problem. I want my knife back, my pants belted, my boots on and everyone's dignity in place when they travel. Why we have allowed ourselves to be victimized by this idiocracy continues to astound me.